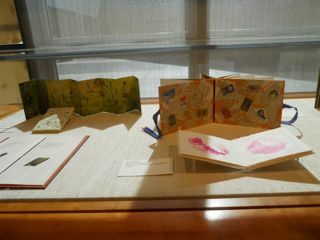 The Bookworks exhibition at the San Francisco Main Library took place this last August 2011. My book that I made was in it. I made it for my grandchildren and it is called READ. I wrote a piece influenced by Aristophanes' By words the mind is winged. It is the one standing on the right of the photo. It is a star book with decoupaged pages from discarded books in English, Spanish, German and French with cancelled stamps depicting writers and communication....Dickinson, Shakespeare, Dante, Mailing......etc.